Trends come and go, no doubt about that, and tattoos all too often fall victim to the dreaded trend. There’s the tribal armband, the barbwire armband, the kanji symbol – all of which are only but a few of the trends we’ve seen over the years in tattooing. Thankfully, their prevalence amongst the tattooed has slowly diminished, though something just as trendy will ultimately take their place. It’s inevitable. That being said, what happens when an entire way of life of a particular culture begins to fade away, much in the same way as a little remembered trend does? It’s certainly not applicable to call the facial tattoos of the Chin women – an ethnic group in the northwest of Myanmar – a trend, but unfortunately for the Chin people, their way of life is dying out. Unlike a trend however, the world is not better off without it. 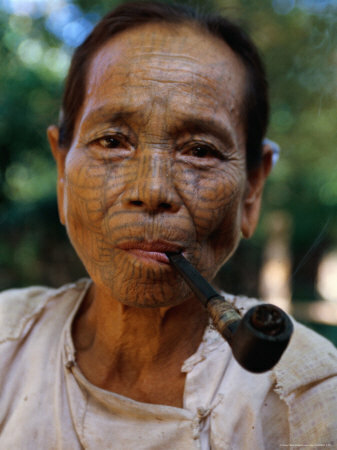 One of the sole surviving tattooed Chin women is now 65 years old, her tattoos faded but still present. Although the educated belief is that the Chin ethnic minority tattooed the faces of the women in the tribe in order to make them more beautiful, history and the eventual distortion that seems to follow tattoos about created a different legend – one that tells a story of tribal leaders tattooing the faces of their women in order to “uglify” them, thereby protecting them from Burmese kings. ‘”These women are the last of their kind,” said Jens Uwe Parkitny, a German photographer and writer who has documented the tradition among different Chin groups over the past ten years. The ritual was officially banned by the then socialist regime in the 1960s, and the tattoos became increasingly rare as Christian missionaries converted the previously animist communities, said Chin pastor Shwekey Hoipang. Today this practice is all but extinct, but tourists are lead in groups up to the place where the tribe lives, in order to see and photograph the remaining tattooed women. That practice itself is controversial. Some feel it is exploiting a culture, others feel that it brings money and change to a nation gripped by a brutal dictatorship. Whichever way you choose to look at it though, one thing is certain: a fascinating history and culture is on the verge of being lost forever and all of us – Burmese or otherwise – will be worse off without it.